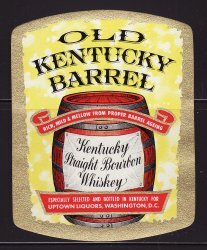 Old Kentucky Barrel Bourbon Whiskey Label. Vintage, original Old Kentucky Barrel Bourbon Whiskey Label. Bottled in Kentucky for Uptown Liquors, Washington, D.C. This mint original label from the 1930s measures 3.5x2,75". Very nice details and gilded image of a old whiskey barrel. Shipped flat in a sturdy envelope. Ready to frame.